During the 19th century, several explorers, including Zebulon Pike, Stephan Long, and later John Fremont, were commissioned to explore the Boulder area. One of Fremont&apos;s men named William Gilpin, who later became the first governor of the Colorado Territory, reported that there was gold to be found in Boulder, sparking interest in an area formerly considered unfit for settlement. The settlement of Colorado was spawned by the lure of gold, due to an economic depression in the eastern United States during the 1850&apos;s. The first settlement in Boulder County was established at Red Rocks, now known as Settler&apos;s Park, by gold-seekers on October 17, 1858. One of the settlers, A.A. Brookfield, organized the Boulder City Town Company on February 10, 1859 from which Boulder City sprang to life. Brookfield became the first president of Boulder City and sixty shareholders divided the 1,280 acres along Boulder Creek into18 lots apiece. The remaining lots were put on sale for $1,000 each. At this price, only a few lots were sold and thus Boulder&apos;s growth rate remained extremely slow. By 1860, the population was a mere 324. At that time, Boulder City was part of the Nebraska Territory. It was not until February of 1861 that a Federal Bill established the Territory of Colorado. By 1867, Boulder became the county seat. 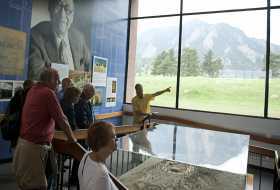 See our Boulder Historic Neighborhoods Walking Tour Map. In the early years of Boulder City, mining played an extremely important role in Boulder&apos;s development. It continued to bring settlers into the area who were both involved in mining itself and in supporting facilities, such as hardware and mining supply stores, transport businesses, room and board houses, and gambling and drinking establishments. Soon a strong agricultural industry, including grain milling, began to develop. 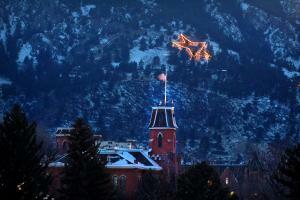 By November 1871, the town of Boulder was incorporated. Now firmly established as an actual city, Boulder dropped the hopeful title of "city" from its name. The first residential areas appeared in the Downtown, Mapleton Hill and Whittier Districts. But as the Downtown commercial activities expanded, the houses began to disappear Downtown, and finer homes were built in the Mapleton Hill and Whittier areas. Boulder&apos;s roots in education began in 1860, when the first schoolhouse in Colorado was erected at the southwest corner of Walnut and 15th Street. Also in 1860, Boulder&apos;s prominent citizens lobbied strongly with the State Legislature to have the State University located here. They succeeded, and on November 7, 1861, legislation was signed to that effect. It was not until 1872 that six Boulder citizens made an actual site available, due to their generous donation of 44.9 acres. Two years later, the State Legislature appropriated $15,000 for the construction of the University, with the stipulation that there be a matching donation by the community. The first building to be constructed with this money still stands today, and is called Old Main, which housed the entire University, including classrooms, a library, auditorium and the President&apos;s living quarters. Old Main was built on the southern end of town, in an area known as "The Hill." The University of Colorado opened its doors in September of 1877, to one building, forty-four students, one professor and a President. Boulder was now well on its way, and was taking on the features of an established town. In 1871, dog control was initiated, in addition to a tree-planting program (Boulder was virtually treeless when first discovered). The first bank opened in 1874, and by 1880, the population had grown to 3,000 as developers had laid out 17 additions to the town. Electricity was made available to the citizens in 1887, and three years later the railroad depot was constructed, providing a new urban sophistication to the use of railroads in the Boulder community. In1893, Colorado became the second state (after Wyoming) to allow women the right to vote. In 1898, one of Boulder&apos;s crowning jewels, Chautauqua, was created. A group of Texans chose Boulder in1897 as a retreat to escape excessively hot Texas summers. 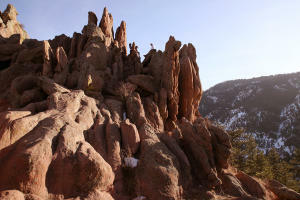 They decided on Boulder and built one of the nations most beautiful vacation spots. One of only three remaining in the country today, Boulder&apos;s Chautauqua was completed July 4th, 1898. Chautauquas at the time were well-respected family retreats, focusing on culture, music, nature, family activities and often religion. This Chautauqua was particularly important for the area because it really began Boulder&apos;s parks and open space preservation. The day after Chautauqua&apos;s grand opening, the city of Boulder purchased the eastern slope of Flagstaff Mountain from the United States Government. 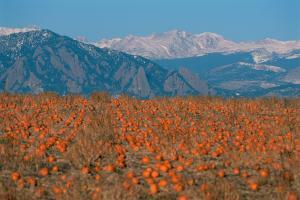 Purchasing land for preservation became one of Boulder&apos;s top priorities and still is today. The City of Boulder Open Space and Mountain Parks program has over 45,000 acres dedicated to parks and open space today. As the University grew to a population of 6,000 students in the early 1900&apos;s, the area around the campus known as "The Hill" began to expand. The population had reached 6,150 and Boulder was living up to her claim as the "Athens of the West." By 1905, Boulder City Council members wanted to promote growth in the area by providing the “comfort of a first-class hotel.” The result was the Hotel Boulderado, named by combining the words “Boulder” and “Colorado” — so that no guest would forget where he had stayed. In the 1950s, 60s and 70s Boulder began to boom with big business. Companies like IBM and Ball Aerospace (a subsidiary of Ball Corporation) moved to Boulder and created many new jobs for Boulder&apos;s growing population. 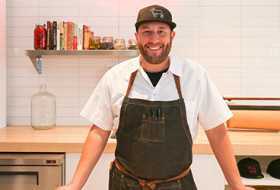 Companies and schools alike also sprung up from Boulder&apos;s own. Celestial Seasonings was started in Boulder by Mo Siegel, and has become one of the world&apos;s largest producers of tea. The Naropa Institute, founded by Tibetan Buddhist Chogyam Trungpa Rinpoche opened its doors in1974 and the Boulder School of Massage Therapy made its debut in 1976. 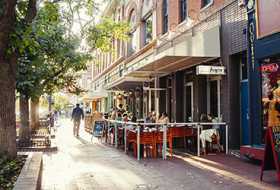 Today, Boulder has 103,000 residents including 29,000 University of Colorado students. Many things in Boulder have changed since it&apos;s humble beginnings, however, there is much that has not. 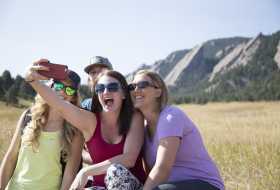 Boulder is as beautiful now as ever, and due to well thought out planning and preservation, Boulder has not lost its individuality or uniqueness as a beautiful place to work and play. 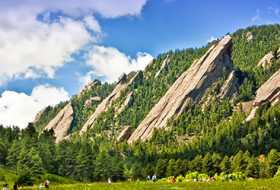 Boulder is now famous for its value of environmental preservation, education, and quality of life. A city that was once considered uninhabitable, as it was a part of the Great American Desert, has flourished to what it is today, overcoming many problems and impediments along the way.